Before you know it, the first virtual crop of the year will be upon us. While we want to make it fun for you, our main goal is to make it a productive weekend. We want to help you make progress on your projects so you are that much closer to having a completed project in your hands. To help you prepare for crop weekend, we are giving you our crop agenda early. This will make it easier for you to plan your own in-person events with fellow p2P members and friends, and will help you set aside time to participate in some or all of the crop. Click the image below to download the printable handout. Please be reminded that pixels2Pages is a GLOBAL COMMUNITY. You will notice that the time some of our offerings publish really early. We don’t intend for you to wake up at 4:00 am to create a page using a Blueprint. Our release times are scheduled so that p2P members and friends all over the world will have the opportunity to participate in crop offering during their waking hours. Our crop is self-paced and you can create using an offering at any time after it publishes. We will have extended hours to play games and win raffles so every time is a good time to participate. During our most recent crops, we have raffled off an exclusive Blueprint Collection to a winning team. We want to give everyone even more chances to win. So starting this crop, individuals will have an opportunity to win the exclusive Blueprint Collection and one lucky individual will win the Blueprint Collection for their entire team. 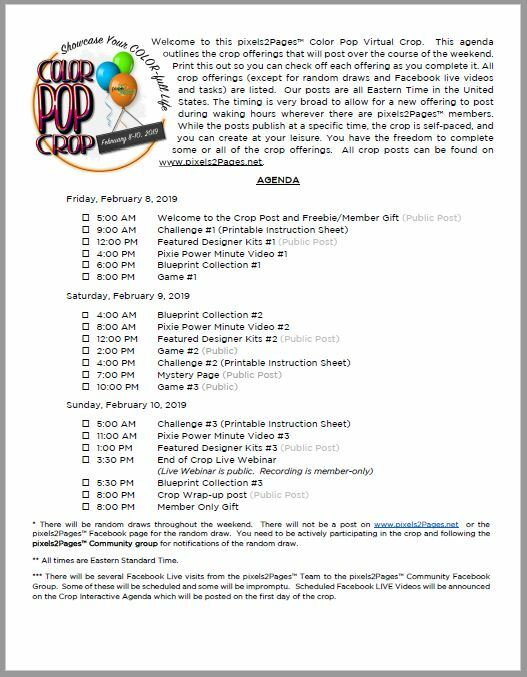 So get your teams together and get ready to crop. Every page posted to pixels2Pages or in our FOREVER Collaborative Album is another entry to win. You will want to prepare as much as possible to get lots of pages done. We are always looking for ways to increase your productivity during our virtual crops. While all of our offerings are pretty flexible and work with just about any photos, we have had requests for a little more disclosure about the offerings so that you can gather the photos and content you need in advance of the crop. We have prepared a checklist for Pixie Power Minute Videos, Challenges, and Blueprints that we hope will make it easier for you to plan ahead. If an offering requires something specific, we will tell you (though most often it is flexible); we give you an idea if photos are in portrait or landscape orientation; and we give you notes that we think will help you select the photos and content that you will need. This is a trial run and we look forward to hearing from you after you have had the opportunity to prepare for and participate in the crop. Then we can determine if this is something that will continue to be a part of our quarterly crops. If you have not done so, please read our Workflow Tip: Planning For A Virtual Crop. Do we need to sign up to be in the crop or just log into P2P or is there a web site we need to log in to? Thanks, looking forward to being there. You don’t have to sign up for the crop – it is made available to all active p2P members. All crop happenings will be under “Recent” on the website. We also post those offerings to the pixels2Pages FB page. When you make a page for the crop, post the page to the pixels2Pages FB Community group. This is my first virtual crop, or indeed a P2P crop. 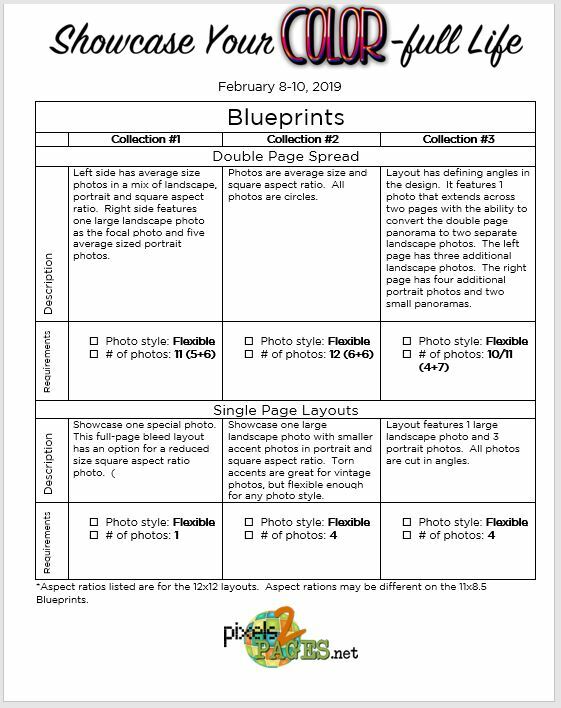 Question: when the prep sheet says Photo style: Flexible, does that mean I can choose either vertical or horizontal, or that I should be ready to use one or the other, when the challenge is announced. I am trying to prep for the weekend and I want to have my photo selection ready. If photos should be in a specific orientation, it will be listed in the description. Most of our offerings allow you to use photos of any aspect ratio, so you won’t see a specific orientation listed. When we say it has a flexible photo style, we are saying that they can be travel, panorama, vintage, etc. Thanks, Tameka! Looking forward to the weekend! I have NEVER attended a P2P crop, as the dates don’t usually work for me. For this one I’m totally free, so plan on doing as much as I can on those two days. I hope I can get a feel for how to do one so I can do more! The checklist is a game changer for me…thank you!!!!! I always get frozen when it’s a virtual crop. This really helped me to get my photos ready and decide what pages will work for each challenge, video, etc. Thank you!!! Any idea why I cannot copy and paste these pdfs? For example, for the bright ideas I open the pdf, then copy and paste it into an Artisan project so I can read the directions while I create my page. It also stays there so I know later on how I did what I did! I wanted to do the same thing with these agendas, so I can have them easily on-hand when we do the crop. But I am unable to click on it and copy. I know I can print them out, but it’s less mess for me if I can keep it all on the computer. By the way – great idea!! Love having these ahead of time to prepare. When the crop time comes you will want to use the interactive agenda. These PDFs are archival PDFs generated from Word, so that may be why it is not recognized as an image. You can use the snipping tool to get a screen shot that you can paste as an image. Oh, the snipping tool – of course!! I feel silly. What do you mean by interactive? Are we supposed to be able to use the checkboxes? I tried opening it with various programs (Adobe Reader, Firefox, Chrome, MS Edge, but none allowed me to check the boxes. Or do you mean “use it while we’re cropping”. Which I am excited for! This is and will be a fantastic tool! Thanks for making them! The interactive agenda is online and has direct links to all offerings listed on one page. Question on the Crop Collaborative album- So we are to post pages there instead of on the P2P Community page, or both? Gets a bit confusing for me as I also post to my own page for family and friends. I am getting excited! Post where it is easier for you. We create the collaborative albums so non-Facebook users can participate. Many members put their images in both FB and the Collaborative Album. We see most prefer the interaction of the p2P Community, so they post exclusively on Facebook and then the p2P Team picks a few layouts and adds them to the collaborative album. thanks for posting this well in advance! I have it printed and am planning! I will be in Disneyland during this crop but I will have photos and stories to tell when I return. Looking forward to doing some of what you offer when we return. Thanks so much for this info, Tameka. I am going to try to be organized instead of all over the place as I usually seem to be during these crops. Me too Janice! I’m so excited to be prepared in advance. Ann Marie, the best part about the crop is that everything will stay on the site. You can participate at any time, and will still have the opportunity to earn bonuses within the week after the crop is complete. I was thinking the same thing. But it is good that we now have all week to try everything.